Summer is well underway, and we're finally getting some sunny days here in Ottawa! With the sun shining bright, it's extremely important to protect your skin. Alba Botanica has two new continuous spray sunscreens, one with a sport formula, and one for kids. Today I also have their facial sunscreen to share with you, as it's crucial to also protect your face from the sun's rays. Alba Botanica's Sport Continuous Spray Sunscreen SPF 50+ comes packaged in a 177 mL bottle. This formula offers broad spectrum UVA and UVB protection at SPF 50+. The continuous spray bottle is air powered, with no chemical propellants, which I really appreciate. This formula is water resistant, making it a great option for a day at the beach playing volleyball & cooling off in the water. 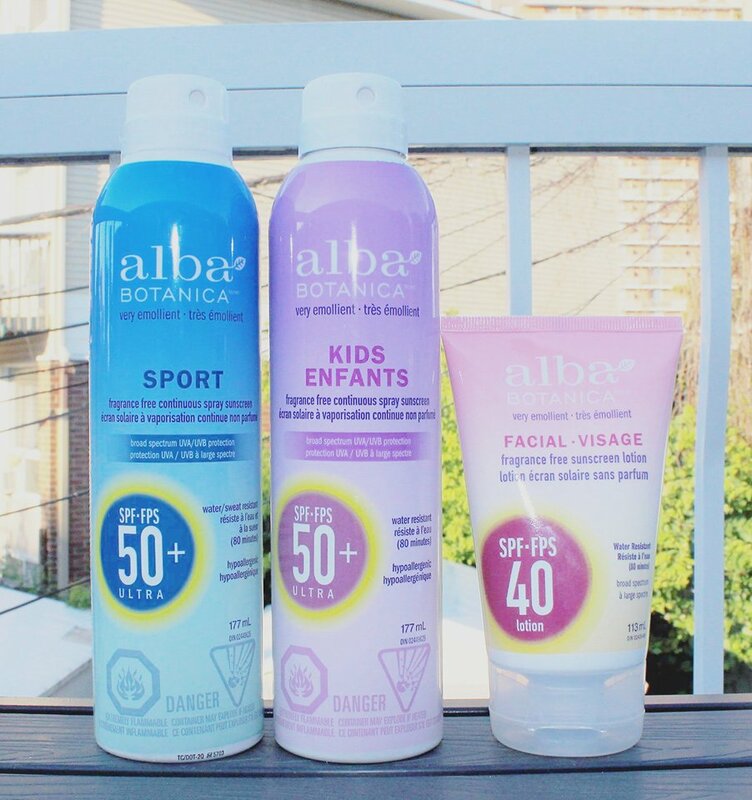 Alba Botanica's Kids Continuous Spray Sunscreen SPF 50+ is packaged in the same bottle as the Sport version. This formula is quick-absorbing and has a gentle formula. These spray sunscreens don't leave your skin feeling sticky or greasy, and they're very lightly scented. Alba Botanica's Facial Sunscreen Lotion SPF 40 has a creamy formula that's been specifically formulated for facial use. This sunscreen includes aloe vera, ginseng, lavender, and calendula, which work to hydrate and nourish your skin. I have to admit, I don't use a facial sunscreen as often as I probably should. So, I'm going to leave this tube on my bathroom counter as a reminder to use it every morning! Alba Botanica products are available at Whole Foods, Loblaws, Safeway, Sobeys West, Well.ca, and Amazon.ca. If you're in the market for cruelty free, vegetarian sunscreens then you should definitely check out Alba Botanica's offerings! I'm also giving away all three products on my Instagram, so be sure to go enter for your chance to win!